Maybe it’s just my imagination, but it seems like there’s always a mad rush of famous people dying the last week or two of each year. I know, it’s a weird thing to notice, but then again, I often notice weird things. 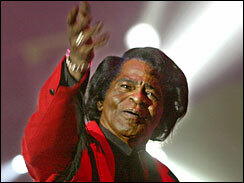 So yesterday it was James Brown. Today it was Gerald Ford. I’ll bet these two guys never hung out together in their lives, but now they’re practically on the same bus. We have five days left of 2006. Who’s next?? Who knows??? Anyway, if you’re a celebrity, please be careful.